Yesterday while browsing Etsy, I saw a beautiful sea urchin necklace on the front page by staroftheeast. (Honestly, I don't remember the exact necklace so the link is to a random one from staroftheeast's shop.) I'd never really thought of sea urchins as being objects of beauty to be treasured, but this piece of jewelry certainly was. I am not really one to wear jewelry either; yet, I knew that I'd happily wear that piece. It is stunning and unique. 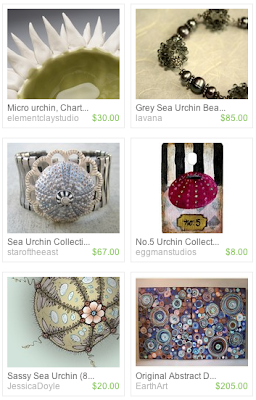 After that encounter, I searched Etsy to see what I could find with a sea urchin theme. Above, you can see a few of the lovely items that I came across. It almost makes me wish that I lived near the ocean so that I could search for natural beach treasures to include in my works.